I realized, a bit late, that I'd already chosen the colour red as a theme for Sunday Stamps... but it seems to be a popular colour and stands out so well, that I left it in. I'm sure no-one had any trouble finding something. This stamp was issued in 2014 as part of the ongoing Photography series. 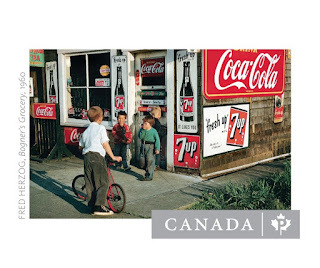 It features a colour photo of a trio of boys hanging out in front of Bogner's Grocery in Vancouver. The photo was taken in 1960, but the small grocery store is no longer there. However, Fred Herzog is still around, and still taking photos at age 85. 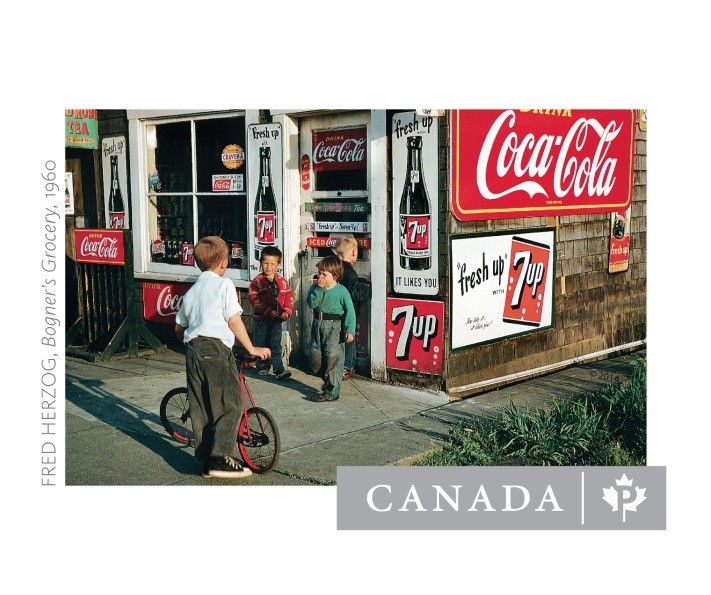 He emigrated from Germany in the 1950's where he'd start working as a medical photographer and spending his weekends and evenings photographing street scenes around Vancouver. I love the Canadian photography sets issued so far. This is a great scene that has pretty much disappeared from US life. Is it the same in Canada? There are still a quite a few variety stores in the larger cities (at least in Hamilton and Toronto). Most of them run by immigrants who must put in long hours and I wonder how they ever make any money. What a wonderful stamp...it is so refreshing! A specific but universal image. most of our variety stores now seem to be advertising lotteries rather than drinks! Thanks for sharing. Free advertising for Coca Cola, not that they need any. Nice ad. for Coca Cola and 7 up - both unhealthy drinks for kids as well as for adults. The children , however, are cute, and 'red' is a lovable color. In doing some research, I found out that at least one of the kids is still alive, and living in Ottawa. I did not know about Fred Herzog. Thank you for the enlightenment. He wasn't well known outside of Vancouver even, until the early 2000's! What a great looking stamp. Not the kind of thing you'd see very often. It looks too good to stick on an envelope & post. Sorry for commenting so late - I feel a bit red in the face, Iconic advert I didn't anticipate on a stamp.